Kai is a fully licensed and registered massage therapist in Ontario with six years of dedicated experience in patient care. He has earned the Professional Massage Therapy diploma from Wellspring College of Massage Therapy and Aesthetics. 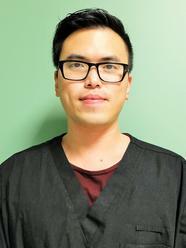 Besides experience working for various reputable health centres in Toronto, Kai always remains in good standing with the College of Massage Therapists of Ontario.